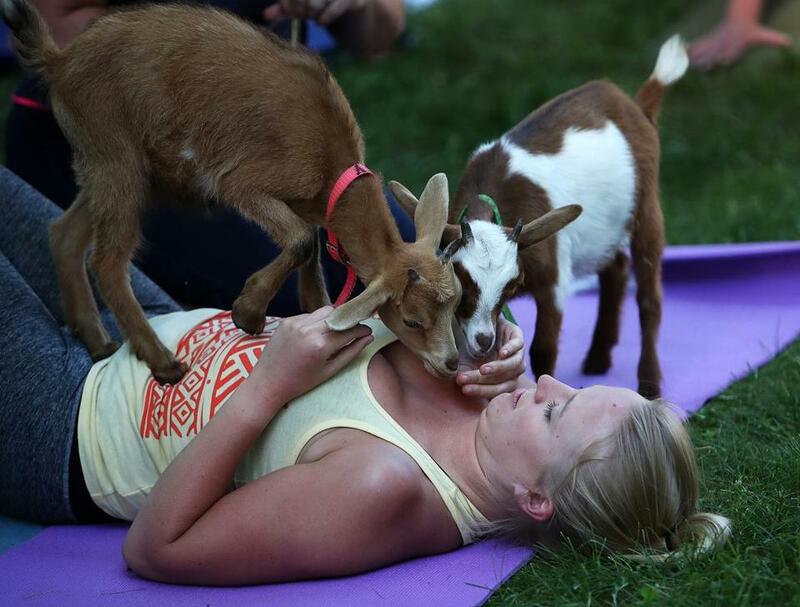 Cats, goats, and downward-facing dogs. The options are endless for yoga with a twist. Kim Beatty of Starkville, Miss., placed a cat on her head during Cats and Mats where participants performed yoga with kittens and cats for stress relief and fun in Starkville. SOMERVILLE — As the students planted their feet and raised their heads while coming forward in a high plank pose, the yoga instructor told them to do something unconventional. “You’re going to scream,” said Black Widow Yoga founder Tina Moroney, nearly shouting to be heard over an Ozzy Osbourne song that blared through a pair of concert speakers. On any other night, the venue — with its “no stage diving,” signs and a floor that smells like stale beer — would host bands like Cattle Decapitation. But on this evening, it’s a makeshift studio for Metal Yoga, a typical yoga class set to double-bass drums and heavy guitar riffs, with a liberal dose of swear words and middle fingers. Everywhere you look, it seems someone is adding a unique twist to the centuries-old practice. For starters, there’s glow-in-the-dark yoga, which fuses black lights and glow sticks with power yoga; the highly popular “Beer Yoga,” where students sip craft brews in a tap room after stretching; and “Goat Yoga,” where sun salutations are interrupted by frolicking baby goats. At Great Rock Farm in Georgetown, goats are incorporated into a yoga class, which is held outdoors under trees and next to a pond. Oh, and don’t forget Marijuasana, a workshop coming to the area that mixes marijuana and “asana,” the word for a yoga pose. Teachers and industry analysts say this sudden phenomenon of experimental yoga is directly correlated to yoga’s surge in popularity. And although it’s true that some of these quirky offerings eschew tradition, they also give newcomers who might otherwise steer clear of those posh Back Bay studios a portal into the stretchy-pants community. Moroney agreed, noting that men in particular seem more comfortable with the nontraditional spin. “It opens up people who may feel like they can express themselves in a new way, and they might not feel like certain other ways of doing yoga really relate to them,” she said. A study by the Sport and Fitness Industry Association found that in 2016, 26.2 million people tried at least one yoga class, up from 23 million in 2012. A separate report conducted by Yoga Journal and the nonprofit Yoga Alliance in 2016 showed even stronger growth: More than 36 million Americans reported trying a yoga class in the previous six months, compared with 20 million four years prior. At the same time, that study found, people are spending more on yoga accessories, equipment, and ona variety of classes, some of which they might view as a place to socialize with like-minded people under the guise of getting fit. Lucky for them, there are plenty to choose from. Whether it’s a one-time class for charity, like the upcoming “Bunny Yoga” taking place in Brookline to benefit the MSPCA, or an ongoing practicelike Moroney’s Metal Yoga, which she typically teaches at the Satanic Temple in Salem, the options can seem endless. 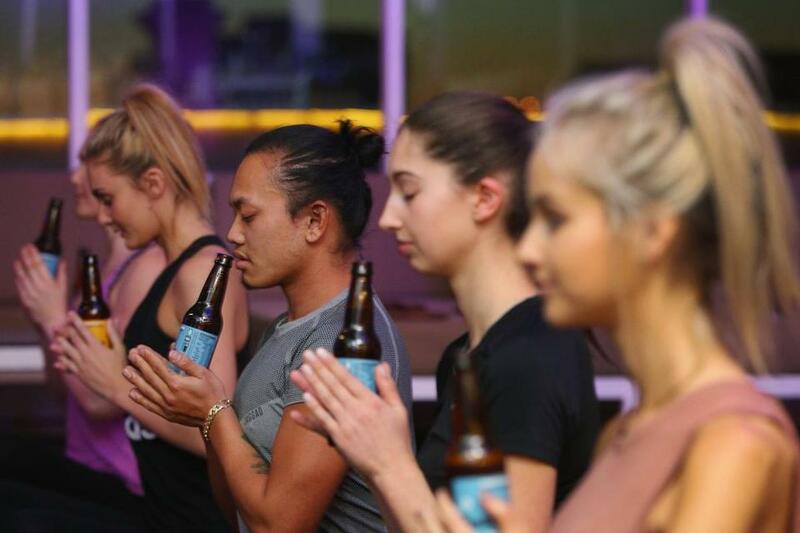 Participants performed Beer Yoga stretches at a Beer Yoga class at The Emerson in Melbourne, Australia. Anything that combines health consciousness and social interaction, he said, is particularly attractive to younger consumers. “It’s desirable to people to be in shape and fit, so if you can fit in a social exercise activity, it’s the best of both worlds,” he said. With greater access to yoga teacher training and less overhead for dedicated studio space as classes are held at breweries and parks, the influx of offbeat yoga styles isn’t surprising. “If you can add bunnies to it, why not?” he said. But some traditional yogis still prefer the basics. Rebecca Pacheco, a yoga instructor and author of “Do Your Om Thing: Bending Yoga Tradition to Fit Your Modern Life,” said she fully supports getting creative when it comes to personal yoga journeys, but given the choice, she’d skip the animal antics and pass on all the bells and whistles. Participants went through poses in a metal yoga class.